Our Office of Homeless Youth Prevention and Protection (OHY) is pleased to receive YWCA of Olympia's 2018 Business of Achievement award. We are committed to learning by listening to youths. ...is committed to raising awareness and supports to end youth and young adult homelessness. The office does not attempt to estimate or guess what youth and young adults need to be their best selves, they utilize youth voice by getting to know the individuals they serve, meeting them where they are at, and collaborating with other organizations such as The Mockingbird Society and Youth Advocates Ending Homelessness. They are committed to improvement, knowing there is more work to do and interested in continuing their services. But they are also willingly evolving, acknowledging that youth of color have been disproportionately represented in the homeless system and starting conversations and necessary work to assure their solutions and resources are equitable and meet the needs of youth of color. While others may be afraid to act, they are working as an influencer, tapping into resources to assure a social justice focus and that youth’s needs are met. Thank you to our wonderful partner, the Mockingbird Society. Together we can assure youth's needs are met. Please forward to other interested parties. 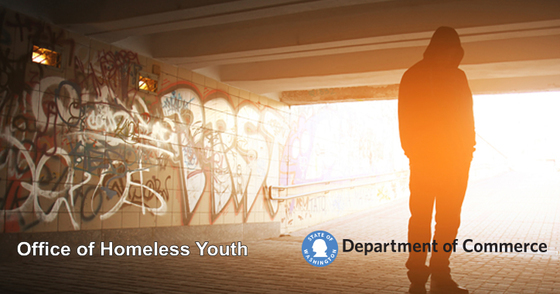 For assistance or information, reach out to to Office of Homeless Youth staff.